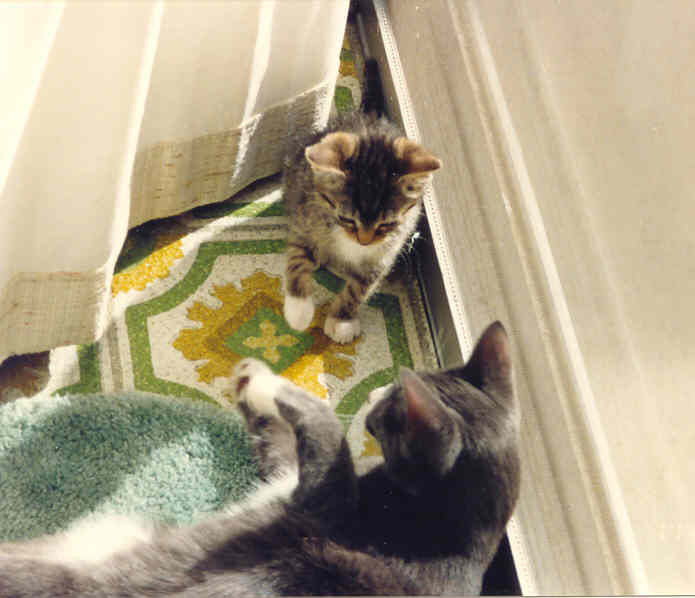 Holly's long (almost a year), brave battle against Stage V lymphoma finally ended on October 2, 2002. The lymphoma had been incessantly attacking her kidneys from the beginning and her kidneys could not withstand any longer. They started to fail very rapidly around mid-September showing the symptoms of advanced renal failure. Daily administration of subcutaneous fluids helped very little. She became progressively weak and her quality of life had diminished very quickly. As much as I wanted to help her fight for her life, it was becoming more and more obvious that she was just enduring, not enjoying, each moment of her existence. I called our vet at noon of October 2 and made an appointment to help her cross the Bridge at 5:00 PM that day. I took a half day off from work and stayed by her side talking to her and stroking her. The 4 1/2 hours flew by like a moment and it was time for us to drive to the hospital. Her passing was quiet and peaceful. When our doctor told me that Holly's tiny heart had stopped, I felt her spirit had left her tired little body, finally able to be free. Holly's body may have lost her battle against lymphoma, but her spirit was not defeated. She fought her disease head on with determination of a little trooper. She didn't give up until the end. I am planning to write about Holly's battle in more details as much informative and useful way as possible for other cats and their Loving Ones who are fighting this disease. It might take a little while for me to do that, so please bear with me. Boy, how deceitful those sad eyes can be! Holly turned out to be the feistiest, the most independent, stubborn, determined, strong-willed cat in our mutli-cat household. She can just stare at Tina long and hard enough and Tina would simply run from her. No one dares to fight with this feisty munchkin, even our Prince Nicholas, the Tycoon and Typhoon of the house. Maybe that's why she has fought her illness with the incredible guts. 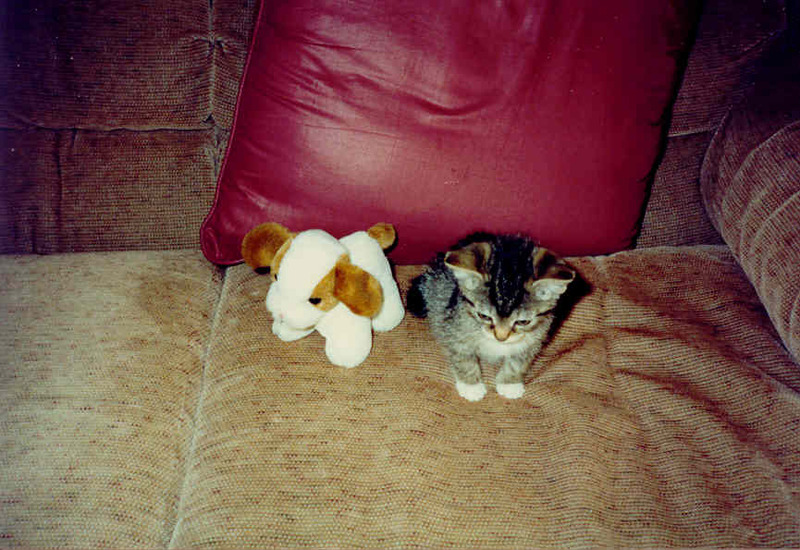 Tiny Little Miss Holly with her friend in 1991. Holly was diagnosed with Stage V lymphoma (gastrointestinal and bone marrow) on October 17, 2001. She has received rounds of chemotherapy and is doing very well as of December 31, 2001. Holly in April, 2002. She had a feeding tube for a month in November. The shaved neck is the reminder.  Her ruff has now fully grown back, but she has lost some hair on both sides of her neck, probably from scratching. The hair on her flanks had almost grown back, but then it had to be shaved again when she had another episode of pleural effusion in the end of May. Her legs are always shaved for IV chemo and other treatment, the hair doesn't have any time to grow back. She looks like a little poodle cat. 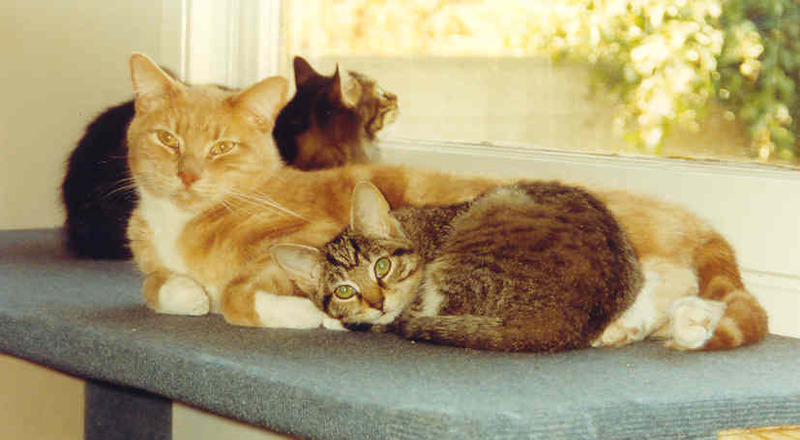 May 11, 2002: Holly wrote a letter to her big brother, Phil, who is at the Rainbow Bridge. July 3, 2002: Little Miss Holly is still hanging in there. She has been through ups and downs (quite "deep" downs several times) in the past five or so months. In February, she has had pleural effusion (fluids in her lungs) for about a month and had her fluids tapped almost every week. She had fairly good months in March, April, and May. Then in June, she had severe bloody diarrhea and frequent vomiting for about two weeks. She had to be hospitalized for three days to get the diarrhea and vomiting under control. She is now stabilized and feeling a little better, but her appetite is not so great. She is "assist-fed" a can of Hill's a/d every day. When she is dehydrated, I give her subcutaneous fluids at home. 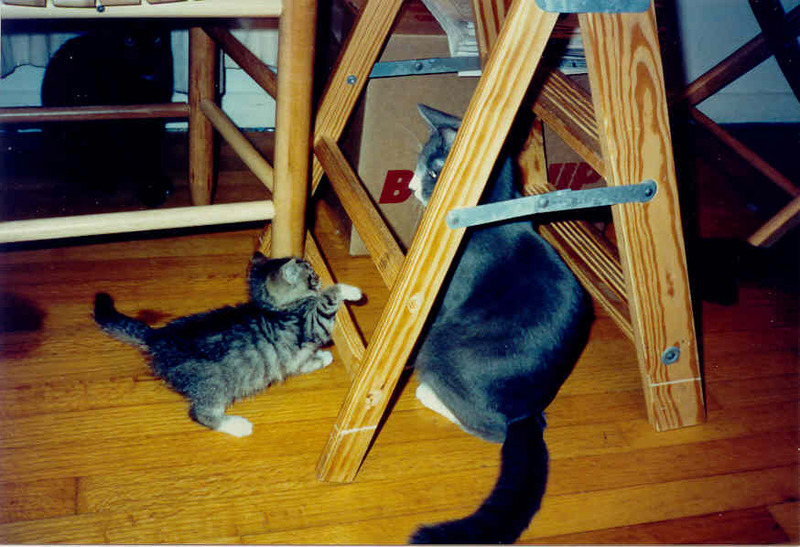 August 18, 2002: Little Miss Holly is doing very well. I started giving her Cansema Tonic III on July 4th. (Cansema information can be found at Alpha Omega Labs' Web site.) This is the bottle that I bought for Angel Phil back in September; I couldn't use it because it arrived two days after I let him go... Anyway! In addition to Cansema Tonic III, I give her grape seed extract and MGN-3 twice a day. The change in Holly is amazing. She eats on her own. She has more energy. Her activity level is up. She is alert and perky. She has no diarrhea or vomiting. She played with a small, crumpled-paper ball for a long time today, batting it, fishing it, carrying it in her mouth, and chasing it across the floor. She is scheduled for another doctor's visit this Saturday. We will find out where she stands. September 19, 2002: Holly's kidney values are getting higher. The blood chemical profile done on the 7th of this month revealed her BUN and Creatinine levels were above normal range. The doctor didn't suggest administering subcutaneous fluids at that time, but I decided that it might be a good idea to start giving fluids to help Holly's kidneys. The doctor agreed and she told me to give her 100 ml. of Lactated Ringer's Solution every other day. She had another pleural effusion a week ago and ever since the chest-tap, she has slowed down considerably. Her appetite is almost nonexistent (part of it might be that she now assumes that being hand-fed is the norm) and her activity level is slightly lower than before. She drinks water frequently. Her overall body strength is still the same. She can jump up on chairs, beds, and nightstand. When I show her her favorite fleece throw, she comes over and starts kneading and purring. It seems she was particularly off for a few days after the chest-tap. Now she is almost back to the level where she was at before the chest-tap. I have ordered Renafood, Renatrophin PMG, and Feline Renal Support (all Standard Process products) from two different online sources. They have not arrived yet as of today, but I am hoping that they will help Holly's kidney function. Ranafood and Renatrophin PMG are human products but many people with CRF (chronic renal failure) kitties are giving these to their cats. One person on feline_lymphoma list warned me about the high calcium content of Feline Renal Support, so I might just try Renafood and Renatrophin. September 28, 2002: Holly has declined considerably. She has been becoming less and less active since the last update. She has been getting up on a drawing table in my office room where I made a little bed for her using a cardboard box and a piece of fleece. But now she stays in a cat carrier on the floor under the table most of the time. We seem to be inching along the last remaining days or hours of her life on earth (at least this particular life). For the last few days, same questions are going through my mind over and over. How can we know that our cats have decided that this is it? What agreement do we and our cats make to come to the conclusion that it is time? When will our cats tell us? How? Or will they? It was easier to make the decision when Phil was nearing the end of his battle against oral squamous cell carcinoma. The tumor was ulcerated and bleeding, and it had invaded the top of his tongue, too. He was in no condition to go on fighting it. It was simply obvious he needed to be freed from his suffering. Holly is still determined to go on despite her physical deterioration. For the last three or four days, I have been watching her, talking to her, and listening to her both physically and spiritually, but she doesn't seem to want to give up. She has not been eating on her own for over two months (or more, I'm not sure). I have been hand-feeding her three times a day. She doesn't have any vomiting or diarrhea. I am giving her sub-q fluids 100 to 150 ml a day (she weighs about 6 lb or maybe less now), 50-75 in the AM and the same amount in the PM. Her urine is very dilute. She spends most of the time in her cat bed (now in the carrier on the floor). She comes out of the carrier when she goes potty (either in the litterbox or on the newspaper that I put on the floor). She sometimes pees in the carrier (she has a piece of fleece in the carrier she really likes; in the past, even before her sickness, she peed on this fleece several times) - I have a puppy wee wee pad at the bottom of the carrier so she can keep herself dry. She walks to water dishes with a little wobbliness but she doesn't fall over. She usually doesn't or maybe can't drink much water. Her eyes are strong and focused. She is alert. When I give her sub-q fluid or feed her in the bathroom, she tries to escape as soon as it's over. I can't take away her life if she is not ready. I need her consent or permission to do that to her. That's how Holly and I have done all the things we have done. She is really a stubborn, strong-willed little munchkin who doesn't give up to the end. I have no intention of prolonging her life just because I don't want to lose her. I have passed that stage. I have already overcome the fear of her death. I am now just concentrating on finding the best time for her to leave her body whether on her own, or with my help. I am not crying because of the thought of losing her, but because it hurts to see her fight like this. Should I ignore her intention and release her soul from her body now? Should I do so to get away from the pain of watching her fight? Do I have the right to do so? Should I wait until she makes her own decision? Or should I wait until she gives me OK to help her? October 2, 2002 - Holly is gone. She went to see her big brothers Phil and Teddy. I feel her energy around me but I miss her little physical body that I could touch. She lost one pound in one week and her body was all skin and bones. With repeated attacks from her lymphoma, her kidneys just couldn't function anymore. She was always thirsty but she could only hang her head over the water bowl, unable to drink. She fought her Stage V lymphoma with incredible determination. I am so proud of this little munchkin. She is my little feisty baby and she'll continue to be my little feisty baby in my heart. Again, with her favorite brother, Teddy. Unfortunately, Teddy had to cross the Bridge soon after this photo was taken. They not only played (pretty rough) together but also they slept together when they got tired playing. Holly knew Teddy was a gentle brother and Teddy knew Holly needed someone to cuddle with.